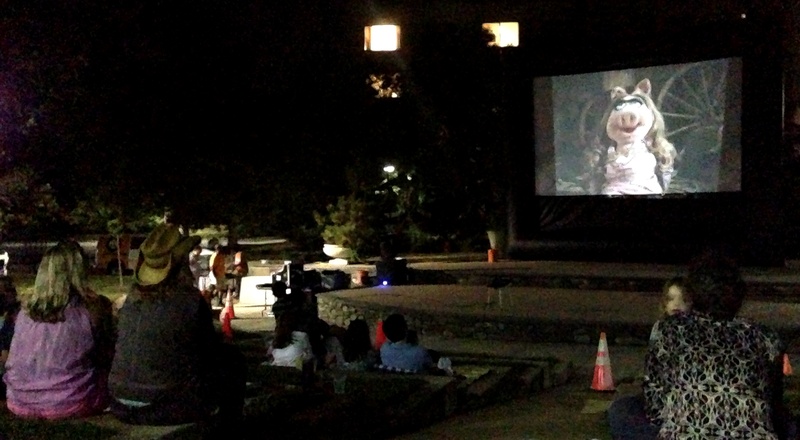 Muppets Come to Tenleytown | Tenleytown, D.C.
Posted on August 17, 2013 by Tenleytown, D.C.
On Friday, August 16, nearly 100 kids and young-at-heart parents gathered at the Woods-Brown Amphitheater in the heart of American University for a community movie night hosted by the school. Families lingered over picnic dinners as toddlers and elementary-aged children ran between brightly colored blankets and up the grassy outdoor steps waiting for the sun to go down. As I sat with my husband and son, I harkened back to my own childhood in a Southern university town, during which many summer evenings were spent enjoying concerts and other events at the university amphitheater. The classic 1956 Popeye for President cartoon that started at sunset seemed remarkably appropriate for a Washington crowd. Popeye and Bluto go head-to-head in an election that, of course, comes down to the final vote from Olive Oyl. The candidates vie for her vote by doing her farm chores, which are keeping her from the polls. In a battle of brawn and, some might say, near vote buying, our spinach-eating hero wins the day. With our appetites whetted by the cartoon, and the free popcorn provided by AU, the crowd was ready for The Muppet Movie. The 1979 classic holds up surprisingly well, despite some 70s specific humor and Hare Krishna references. I had forgotten how many legendary stars appeared in the film, including Dom DeLuise, Carol Kane, Milton Berle, Mel Brooks, Charles Durning, Elliott Gould, Steve Martin, Richard Pryor, Bob Hope, Telly Savalas, Orson Welles, and many more. The names didn’t impress the young folk, though their parents often murmured as each forgotten star crossed the screen. The little ones were all about the gags, corny jokes and music. My favorite moment of the night was watching the kids’ cutting a rug to Movin’ Right Along, as I bobbed and swayed in my seat right along with them. The evening was a nice reminder that the university and the community can come together, especially given the, at times, contentious debates between the two over campus expansion, school-owned commercial buildings, and the off-campus activities of a small subset of students. Though AU has reached out through the local listserv regularly, judging by recent emails American University seems to be stepping up its efforts to engage its neighbors, including a recent call for community members to audition for university music ensembles. I hope AU will continue to convene neighborhood events, and that in turn residents of AU Park and Tenleytown take advantage of all American has to offer. While there was a decent turnout for the movie, there was still room to spare, and it would have been great to see more neighbors there. Did you attend the community movie night? Share your thoughts on the evening by leaving a comment.